Right on the heels of our completion of a new website for Bayfront Bistro , we just launched a new website for Snook Bight Yacht Club & Marina, located on Fort Myers Beach, Florida. We have been working with this client since 2004, and together we have both enjoyed tremendous growth and success. The new website represents the new $22 million facility well, and makes it easy for users to find the information they are looking for. The Fort Myers Beach boat rentals section has been revamped also to provide larger pictures of each boat, as well as easy to follow specifications and boundary levels. Each section of the new website has an online form to easily contact the marina and express interest in either requesting service for their boat, boat storage or to request a Premier Pontoon sales brochure. In addition to the new web design and development, we included an expert level of search engine optimization as we do with all websites we create. 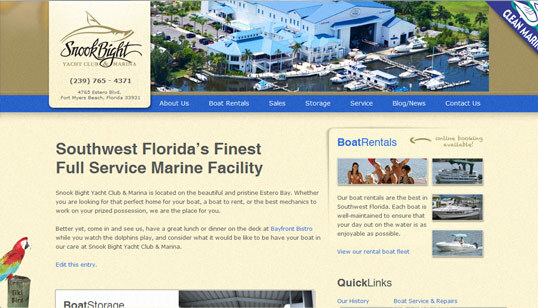 The Snook Bight Marina website ranks very well on the major search engines for several search terms including boat rentals Fort Myers Beach, boat storage Fort Myers Beach and many more….